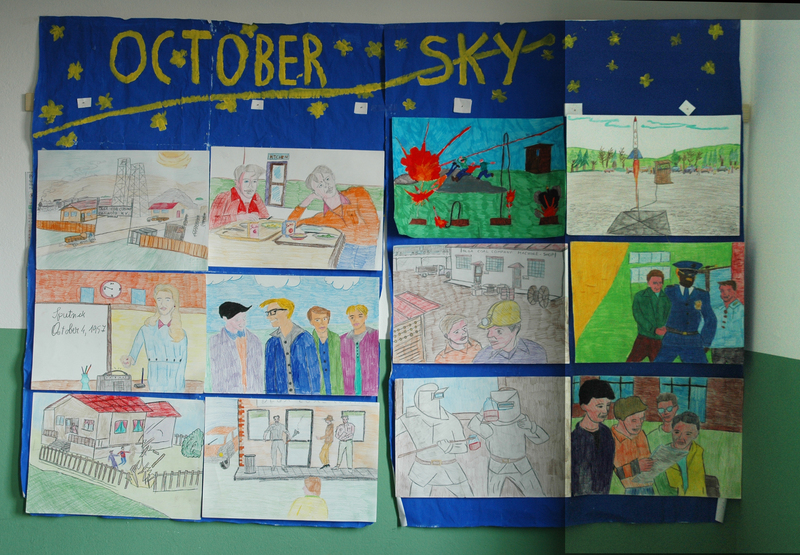 Each year, fifth-grade teacher Agostino Alberti of Soncino, Italy, asks his students to watch the movie October Sky [dubbed in Italian] and then make drawings and write essays about the movie and what they learned. Above are the drawings from the students of the 2015-2016 school year. Excellent job! (Please click on the image above to enlarge it. Once it is enlarged, you should be able to enlarge it more by clicking a second time. This will enable you to see the detail of each drawing.) Click here for the names of the artists (opens as a Word file). 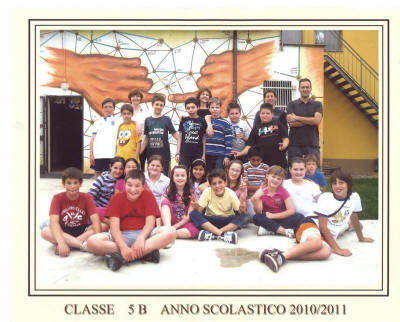 Here are the picturesb[above] of the two actual Fifth Grade's classes V A and V B from Soncino. 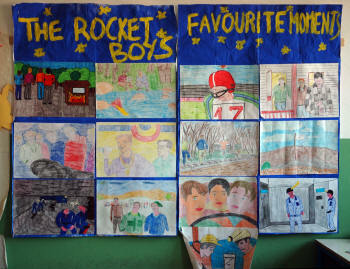 The boys and girls have watched the movie "October Sky", have listened to the reading of some parts of the book "Rocket Boys," and have written texts about the Rocket Boys' saga. Maybe I could forward you some extracts from the texts with the impressions of the pupils. As happened two years ago with my students, now YOU ARE THE HEROES of the schoolboys and schoolgirls of these classes! Again, the example and the paragon of the "Rocket Boys" has hit in the mark: Your experiences and adventures have thrilled them and they are now on top of the World! "I heard about you for the first time in the movie October Sky. I have watched it at the picture house for the first time back in 2001. I know the film is simply 'based on a true story,' and it is not an historical source, but I am convinced it is a quite good movie. 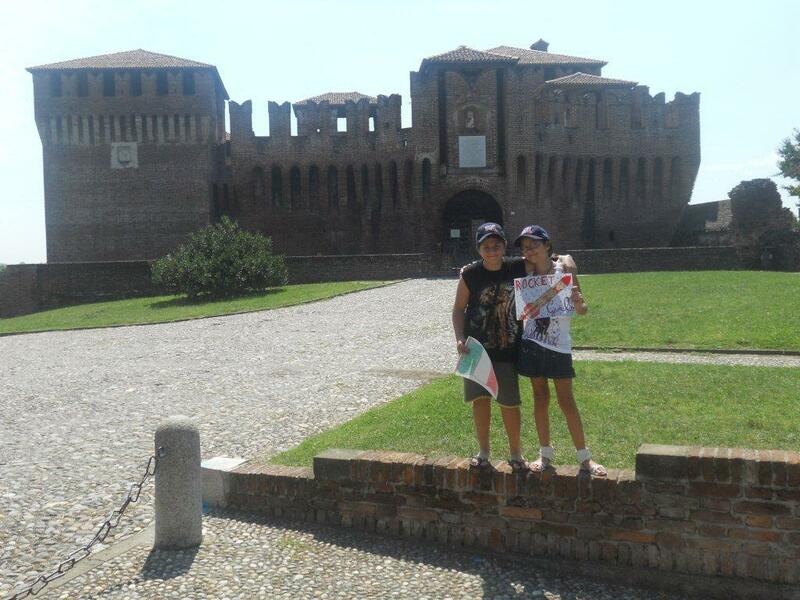 Well, as I am a primary school teacher, I show my scholars the Italian version of that movie, when they are 11. Here in the Cremona area in the XXI century we are not forced to go to work at the mine as you were in Coalwood back in the '50s; however, it is quite difficult to persuade the schoolboys to go on with their students' career and to apply themselves with more effort at school. So, the example of the 'Rocket Boys' from the small Coalwood is very meaningful for them. 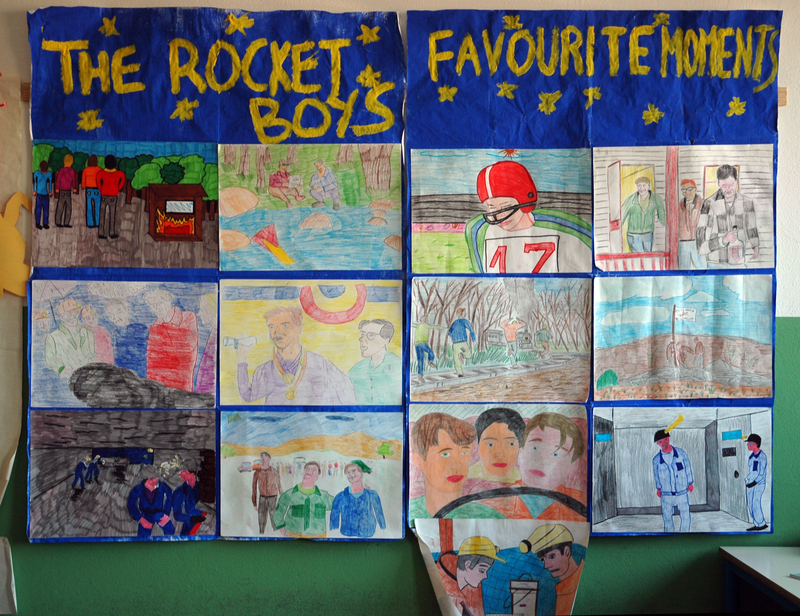 My schoolboys watched the movie last week and now they are going to write compositions and do drawings about the story of the mine, the Sputnik, Miss Riley, your adventures and your final success as they are depicted in the movie. To make brief a long story, in this moment you and the other three 'Rocket Boys' are their heroes!" Mr. Alberti also attached drawings from his students (see above). 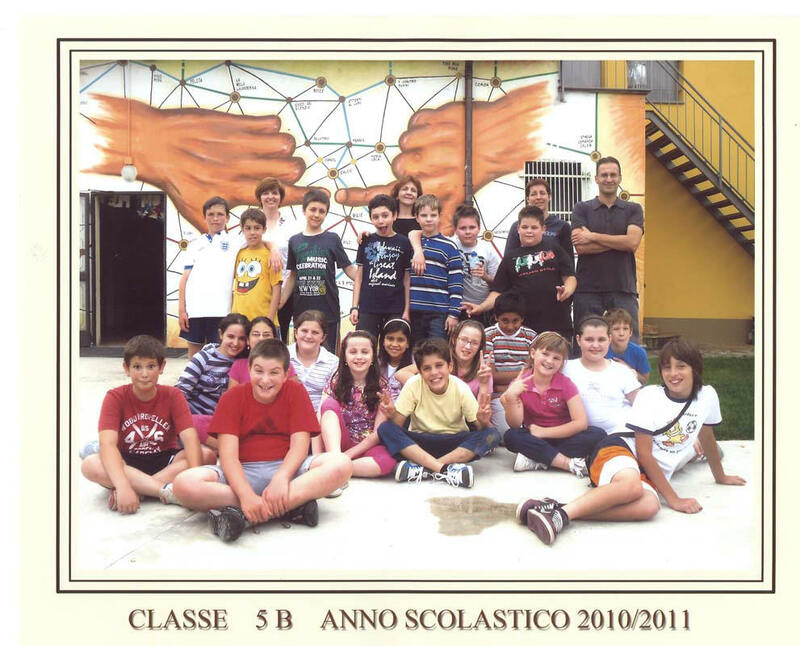 Aurora Bertoletti; Angelo Bevilacqua; Sara Bosio; Cristian Cocchiara; Andrada Covaciu; Andrea Demarchi; Gabriele Didirea; Giulia Duranti; Erika Grazioli; Paolo Iurilli; Martina Locatelli; martina Maccabelli; Gulia Mainardi; Matteo Nodari; Nicholas Pedretti; Isabella Piccioni; Alberto Ponti; Stefano Secchi; Aswinder Singh; Asia Strepparava; Luca Tarenghi; Cesare Zampieri. 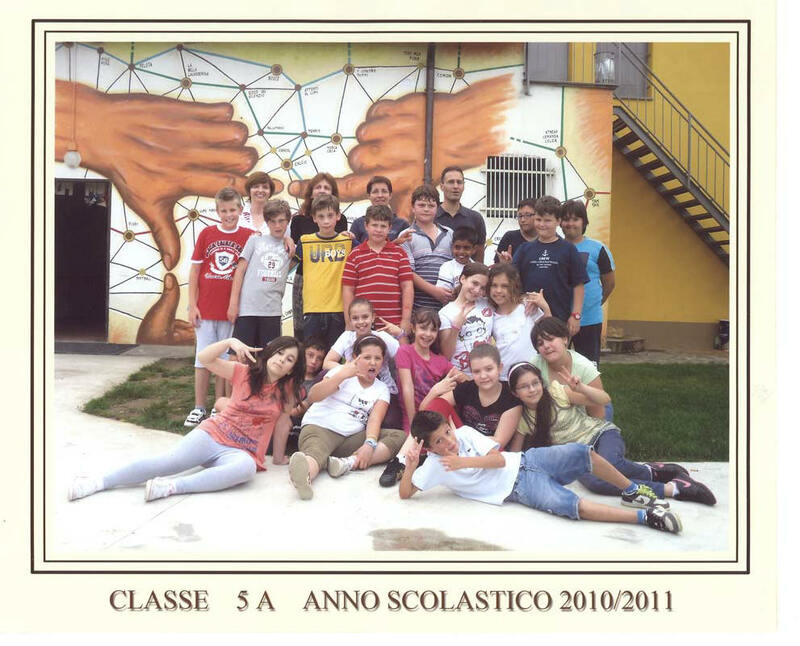 Charlotte Achilli; Chiara Calonghi; Irina Cavagnoli; Filippo Cedri; Pietro Cremonesi; Emma Ferrari; Marco Fontanini; Cesare Ghidini; Luigi Mariani; Filippo Moro; Giulia Moro; Lucia Ottolini; Marco Pea; Sabri Pepa; Paola Piccioni; Mario Pizzocheri; Preet Preet; Sara Riccardi; Luca Sidoli; Nicola Soldo; Sabrina Tapia; Nicholas Trombino; Giorgia Vavassori. Greetings from the Rocket Girls of Soncino! 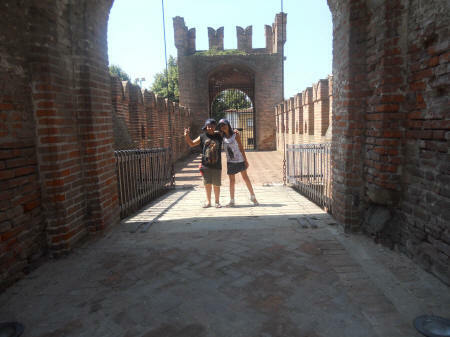 Please click here to find Soncino (Cremona), Italy, and Coalwood, West Virginia, USA on a Google map! Use your mouse to move around the map and zoom in and out.